So the votes are in and we had a tie between Lonely Giant and Sporting My Roots. And since my aunt sent in the Sporting My Roots suggestion I decided to keep it in the family and make that one the winner. Thanks again for all the wonderful suggestions! I’m writing to inform you that the Appalachian “Mountains” look like hills compared to the Sierra Nevadas, it’s cold and foggy 363 days out of the year in San Francisco and the Giants are not just a football team. I’m tired of posting about the Giants’ playoff hopes on Facebook and inevitably somebody writes back, “They played on a Wednesday?” Or, “Innings... you mean quarters.” Yes. Thank you. Clearly I am ignorant about the world of sports. I’m tired of paying for things with my Giants MLB rewards credit card (which CLEARLY has the “SF” logo and a baseball jersey on it) and having the cashier ask me if I’m from New York. Or if I like football. 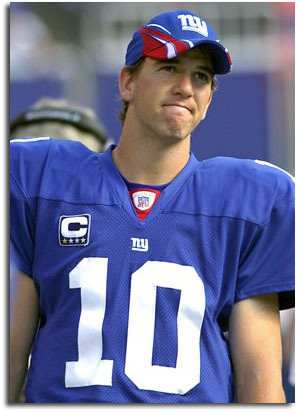 Or Eli Manning. I’ve had jobs in customer service – I know they’re just trying to be nice and make conversation. But a part of me dies on the inside when I have to engage in yet another conversation with an East Coaster that sounds something like this. Cashier: blank look on the face. I can’t tell you how happy I was when I used that card in the San Francisco airport and the cashier asked me what I thought of Tim Lincecum. I practically hugged the poor guy then spent the next five minutes telling him what I’ve just described. This is what the East Coast has reduced me to. Holding innocent clerks in California hostage because somebody hears “the Giants” and doesn’t think of football season. Will this ever change? If the Giants make the playoffs next year (my hopes for this season’s wild card slot are shot) will I have to have fewer of these conversations in the future? Or am I just doomed to forever being overshadowed by the blue and red?